I love the Los Angeles Opera and have enjoyed its frequently wonderful productions in the Dorothy Chandler Pavilion for many years — back to the very beginnings of the company, in fact, and one might say even before. I recall the residence there of the New York City Opera when Beverly Sills reigned and Plácido Domingo hadn’t yet become a household name. I remember well his electric performance in Ginastera’s Don Rodrigo. And here he is now, still going at age 76, conducting the current performances of Bizet’s The Pearl Fishers. This coming weekend he will sing the title role in Verdi’s Nabucco. If my tone sounds nostalgic it is because I am the same age as this great artist and haven’t accomplished anything vaguely close to what this monumental overachiever has done. I am also just emerging into daylight after many months of health issues which have prevented me from coming back to LA until last Saturday. 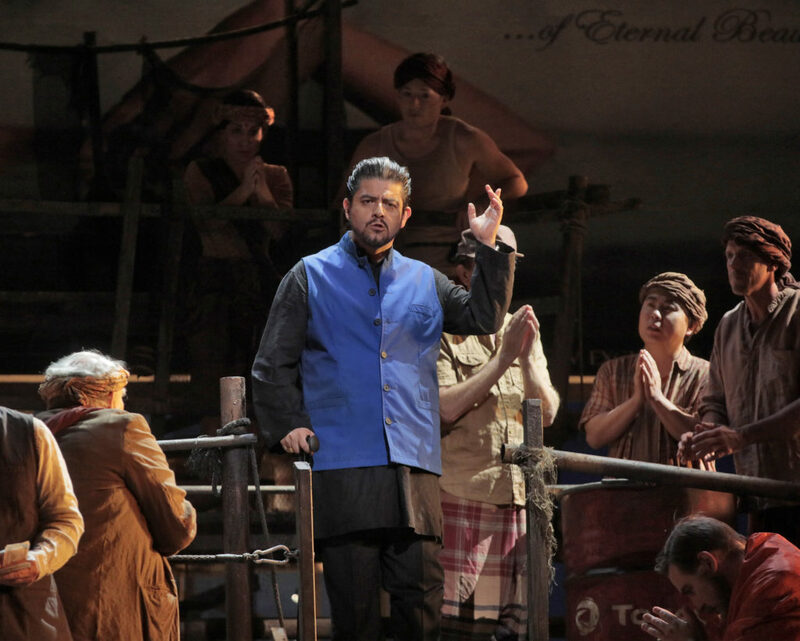 Showing his usual deference to the singers, Domingo helmed the collective forces of the LA Opera for a splendid and sometimes spectacular production of Bizet’s once fairly obscure exercise in musical/dramatic Orientalism, a term used by critic Edward Said to describe the West’s romantic and often patronizing misrepresentation of Eastern cultures. 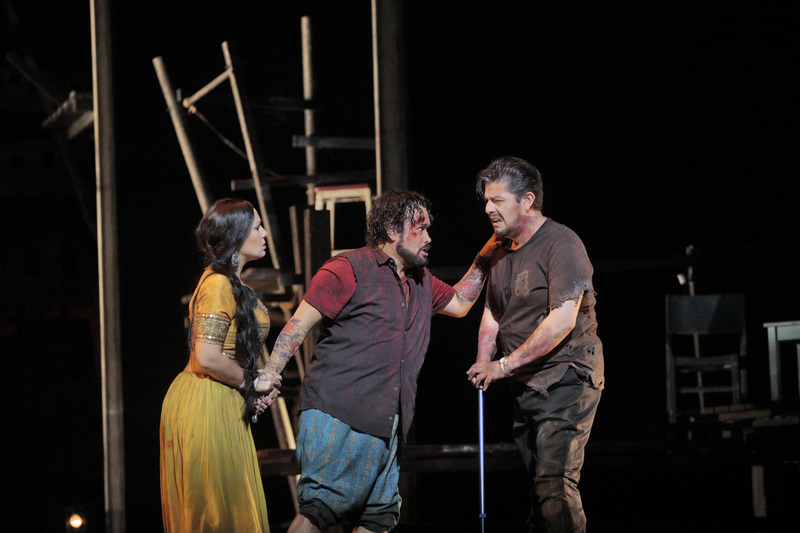 This is common in many of the operas we love (Madama Butterfly and Turandot just for starters), but Bizet’s Les pêcheurs de perles, with a libretto by Eugène Cormon and Michel Carré, is especially whimsical. It has also taken many years to come into the standard repertory. I recall a Los Angeles classical music radio host calling it a dull opera with one hit tune, the big duet for the tenor (Nadir) and baritone (Zurga), “Au fond du temple saint” . The Robert Merrill and Jussi Björling recording is an essential listen. My favorite passage, however, is Nadir’s gorgeous aria sung all in head tones, “Je crois entendre encore” and I was not disappointed by tenor Javier Camarena’s singing of this at Saturday’s opening night performance. His was the finest of all the excellent voices to be heard that night. 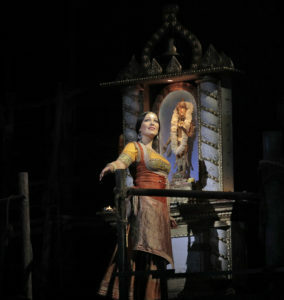 Soprano Nino Machaidze offered an especially alluring Leila, the Hindu priestess at the apex of a village love triangle. Poor lovely Leila is a bit frisky with her vows and this leads to many complications including the fishing village going up in flames when our noble leader, Zurga (sturdy baritone, Alfredo Daza), turns arsonist to distract people from seeing him free Leila and Nadir from their imminent execution. (If this were an old Technicolor movie, Leila would be Maria Montez and Nadir would be Jon Hall, and all would end with an active volcano pouring lava on the villagers). I at first thought Machaidze’s’s voice was too heavy for the role — probably because I am used to hearing a lighter lyric soprano on recordings, but I am very fond of this artist and she wins one over with the strength of her portrayal. Daza started out weakly, I thought, but gained in strength quickly and was particularily good in Act Three. A fine heroic figure. 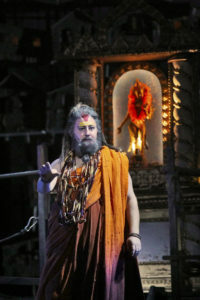 And not to forget our excellent, authorative priest, Nicholas Brownlee as Nourabad. The male bonding duet, by the way, was very satisfying, especially with the unauthorized repeat which doesn’t appear in the original score. All of this nonsense takes place in a fishing community full of pearl divers in an imaginary Ceylon which surely never existed. It’s now called Sri Lanka, a place I have stayed for a month of my life — often silently singing Bizet’s tunes in my head for a ironic contrast to stark reality. It’s very sunny there, but don’t tell that to the skilled lighting team at LA Opera. I am always amused when Seville shows up as dark and gloomy in productions of Don Giovanni. Everything in Pearl Fishers takes place at night perhaps — and the island is storm ravaged, so that’s why it’s so “finster” in this Ceylon. In any case, Ken Howard’s excellent pictures show what the production looked like. Below is a remarkably conceived set, presumably Zurga’s office. 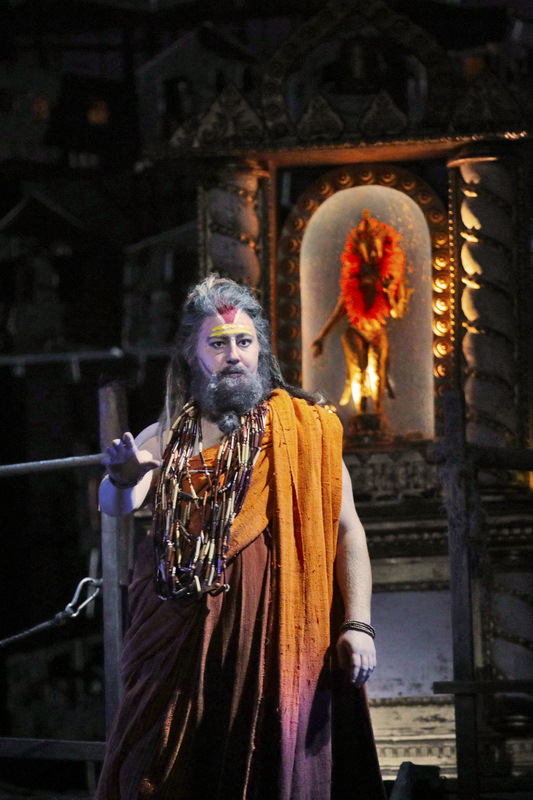 If LA Opera’s The Pearl Fishers could be called “maximalist” in that it offers opera goers everything they want to see and hear — a fine orchestra, wonderful singers, excellent choral work — next door at Disney Hall this weekend things were decidedly minimalist. Minus all the scenery, magical forest creatures and Masonic ritualism — and lacking even the God-like character of Sarastro and his glorious music (to my dismay!) this pared down The Magic Flute was pure pleasure. Gustavo Dudamel led the Mozartian sized group of LA Phil players in a translucent, vibrant performance in which a top-flight cast of younger singers (all of their names are listed below) were seemingly left to their own devices to play their scenes here and there about the totally undecorated stage. This was the spirit of opera distilled. Great singing, great character interaction, inspired conducting — and without an elaborate aerial acrobatic tableau to draw us in. 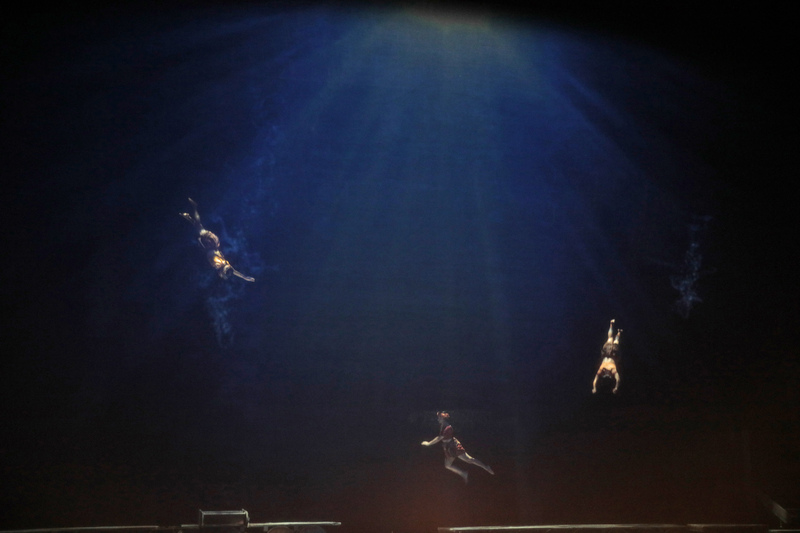 Yes, those are living performers in the aquatic photo that tops this page. Rhinemaidens, please take note next time The Ring comes around. 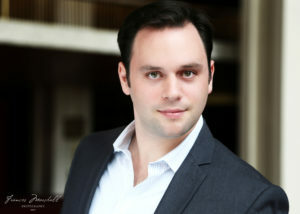 Tenor Paul Appleby. Photo by Frances Marshall.